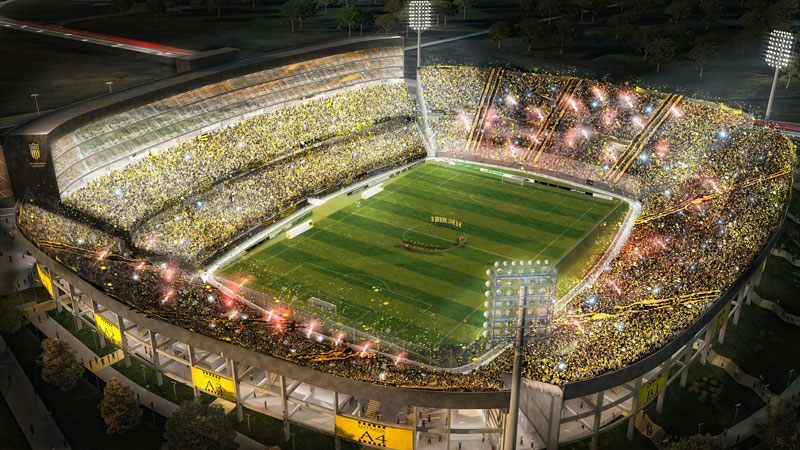 First plan of a new stadium for Peñarol was presented in… 1933. And since then there were many more visions, especially in the current century, but the club was forced to use Estadio Centenario for nearly every game. Thanks to securing bank loan in 2013, the latest bid could finally come to fruition. 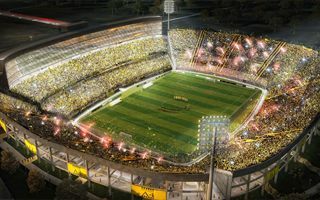 The stadium on nearly 15 hectares in north-eastern outskirts of Montevideo (near a significant road hub) will have an unusual setting with main grandstand in the north instead of west side. All sides of the pitch will be accompanied by double-tiered stands, but the main one will also have 3 levels of corporate boxes topping it. Thanks to this layout, the northern side will hold most fans, 12,104 (2,660 in boxes). The opposite straight will accept up to 11,141 people, while both ends 8,380. To make the project most realistic, it had to be cheap. 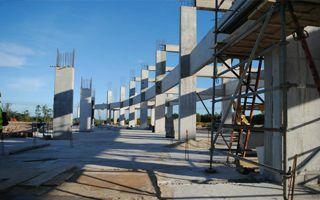 Initially planned to cost $25 million, it eventually grew to $40 million. But that amount is still very low compared to its capacity, reached at the expense of roof, outer cladding and amenities planned. Entire lower tier will be built in a sunken bowl, while the concrete structure of upper stands is kept very simple. Cornerstone mounting took place in Dec 2013, but actual groundbreaking happened in February 2014. 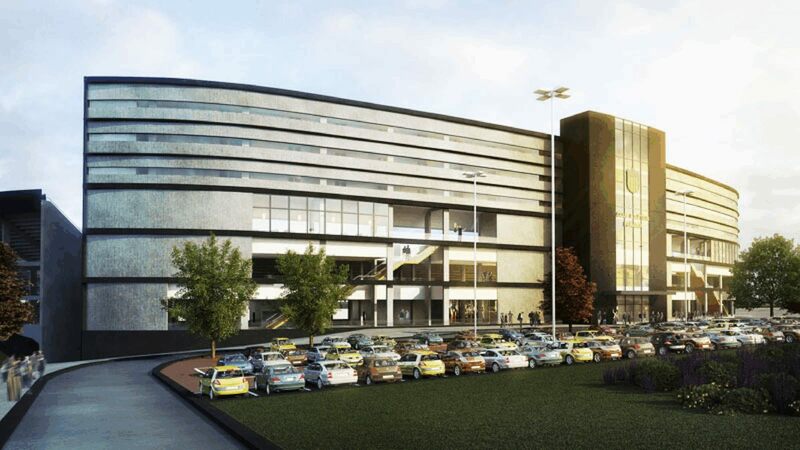 With over 150 workers on site for the most part (doubling at peak), the project is expected to end in June 2015. 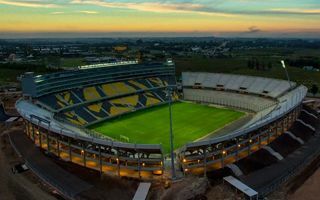 Peñarol is paying for the development from the sale of its northern stand. All skyboxes were booked by late 2014, while long-term or permanent licenses on seats are to cover the remainder. 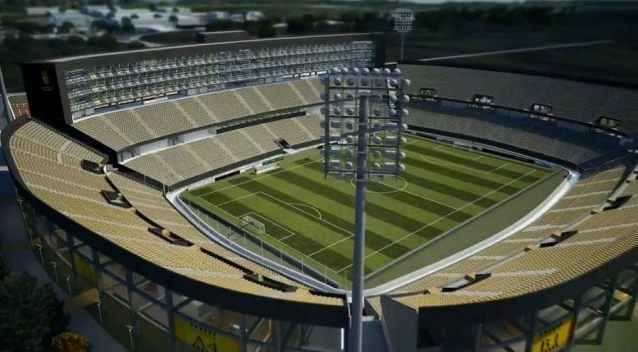 Uruguay’s most recognised football club is awaiting the completion of their new stadium. The “Sunflowers” are relocating to the fields outside Montevideo this summer. One of the world’s most famous clubs will eventually move to their desired new home this year, ending 82 years (!) of failed attempts. Aurinegras move from central Montevideo to rural outskirts.